Soil contamination is one of the serious environmental issues that our planet is currently dealing with. Plant-based remediation has been drawing attention as its new countermeasure. One of our sub-projects titled Towards sustainable remediation of arsenic-contaminated soils,” which is led by Prof. Celine Pallud at University of California, Berkeley, focuses on the study of plant-based remediation of arsenic-contaminated soils using the brake fern (Pteris vittata L.). Mr. Sarick Matzen, the project member, visited RIHN on July 1st and gave a talk on the progress and challenges of the research. 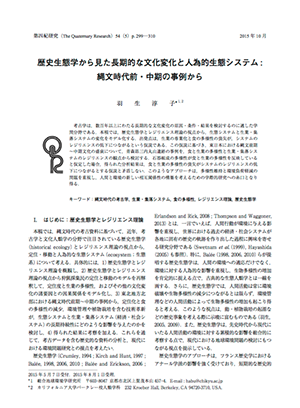 Prof. Habu's article titled "Mechanisms of long-term culture change and human impacts on the environment : A perspective from historical ecology, with special reference to the Early and Middle Jomon periods of prehistoric Japan" was published on the Quaternary Research, the journal of Japan Association for Quaternary Research. 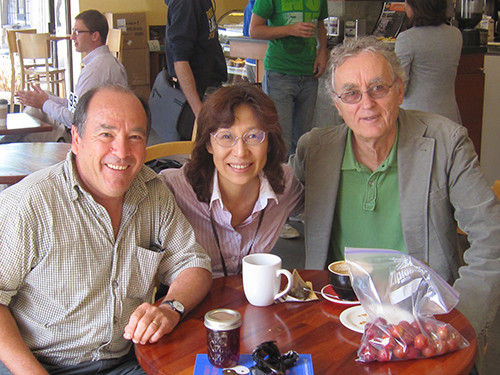 Photo＝With Prof. Miguel Altieri, an agroecologist (Left) and Prof. Fritjof Capra, a physicist, at a coffee shop near UC Berkeley. --- In this section, past and current RIHN project leaders tell stories about their research and dreams for the future based on a photograph that they have chosen. Jomon period archaeology is my field of research. Archaeology is the study of inferring the lifeways of people of the past from the analysis of material culture or archaeological remains excavated from archaeological sites in order to examine the process of cultural and social change. Simply gazing upon the remains, however, does not lead to an understanding of those who were using them. For example, Jomon archaeologists know that an arrowhead from the Jomon period is heart-shaped, but those who have never seen this type of arrowhead would not be able to tell what it is just by looking at it. Properly interpreting the information obtained from archaeological sites and remains requires the application of theory to link archaeological records with the lifeways of those who were using these items. Archaeologists infer interactions between human activity and material culture, borrowing various theories, including mathematical models from other fields such as biology, or referring to ethnological case studies. Interdisciplinary research, that is, collaboration with researchers from other fields of study, is, therefore, a prerequisite for the study of archaeology. In the summer of 1991, while I was a graduate student of Anthropology at McGill University, Canada, I participated in the excavation of a dwelling site of the Tule culture (1,000 to 1,500 A.C.) on Somerset Island in the Canadian Arctic Archipelago. The weather there is quite cold even in summer, and the temperature in midsummer is about the same as that in December in Japan. The area is also isolated, being more than 40km away from the closest community. What was most memorable during the six weeks of my fieldwork was the number of polar bears that I encountered. They numbered as many as 35, which unfortunately did not make my summer enjoyable. However, ethnographical records useful to understand archaeological samples were abundantly available in this area, and the archaeological remains in the permafrost soil were in particularly good states of preservation. This area proved to have some of the most favorable conditions for archaeologists who work to interpret lifeways and activities of human beings from the analysis of material culture. 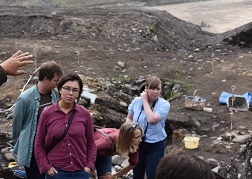 This excavation allowed me to reap the reward of learning about how archaeologists conducting research in the Arctic applied ethnographical and ecological knowledge and theory to their research. After receiving my Ph.D. from McGill University, I started to teach archaeology at University of California, Berkeley. 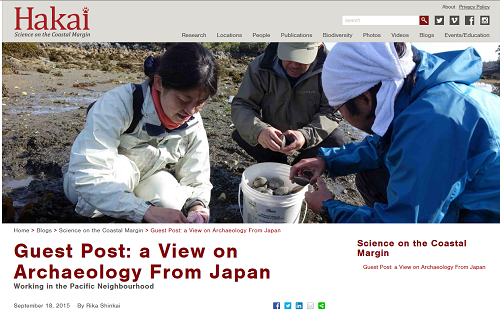 In 2010, I was co-affiliated with RIHN as a Visiting Research Fellow and presented my research that a highly specialized subsistence strategy, in other words a decrease in subsistence and food diversity, in the Middle Jomon Period (about cal. 5,000 B.P.) caused greater vulnerability in the economic system and, as a result, led to a population decline. This research fellowship provided me with the opportunity to have an active engagement with researchers in diverse fields affiliated with RIHN. In the course of my research at RIHN, I started to think more about what kind of role food diversity played in the history of human beings. The case studies from the modern era have evinced that food diversity is crucial in maintaining long-term stability of economic and social systems. For instance, the adverse effects of monoculture (production of a single crop/plant) have been actively discussed in the field of agriculture. How far should we go back in history to understand the origin of this kind of problem? And, how can we avoid it? Such questions started my Incubation Study at RIHN. After two years of a start-up phase as a Feasibility Study, the Small-scale Economies Project was officially launched in 2014. This academic year marks the third and final year of this project, during which we are focusing on wrapping up our research outcomes. The North Pacific Rim, specifically northern Japan and the west coast of North America, is our regional focus. On the basis of our research on the past and present through archaeological, historical, paleoenvironmental, ethnographical and ecological studies, this project also points to the future as we aim at developing implementation and public outreach programs as well as presenting policy proposals for future generations. The core of this project constitutes not only the interdisciplinary approach of collaboration with researchers from other fields, but also the transdisciplinary approach of closely working with a wide range of stakeholders linked to the research objective, including the indigenous people, local residents, farmers, fishers and members of NPOs. The project involves 81 members including 35 members from abroad. Many of them conduct the world’s most advanced and ambitious research in various environment-related fields. 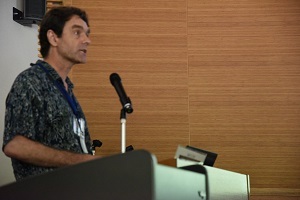 One of them is Prof. Miguel Altieri at University of California, Berkeley who was at RIHN as a Visiting Research Fellow in May 2016 and actively participated in the exchange of opinions with farmers and researchers in Japan (Photo). Another is Prof. Fritjof Capra who is known for his famous book “The Tao of Physics” (Photo). It is always a pleasure to be able to engage in discussions with such freethinking scholars regardless of differences in academic disciplines. My dream is to develop a consensus to counter the monoculturization of food production and resultant large-scale environmental breakdown through these interdisciplinary, transdisciplinary and international discussions. Albeit there are differences in language and culture, researchers grow to understand one another once we work together, and are able to disregard minor inconveniences. RIHN is such a place that makes this possible. In May 2016, Dr. Miguel Altieri and Clara Nicolls of the University of California, visited RIHN. 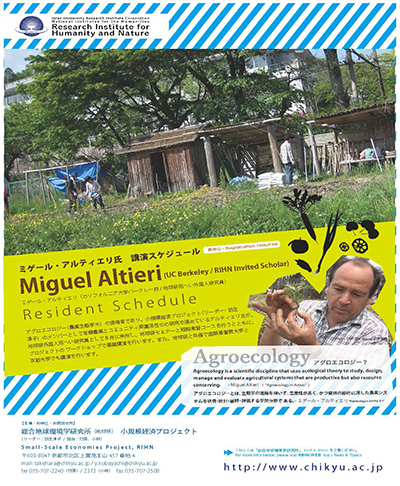 Our project took this excellent opportunity to host a series of events dedicated to agroecology. 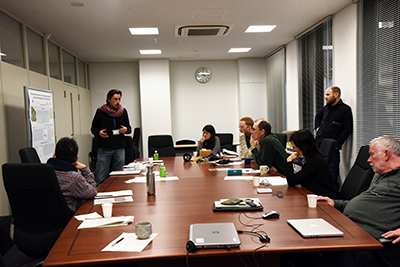 Together with project members, discussions were held on the challenges of and opportunities to scale-up agroecological practices in Japan for the purpose of achieving a more sustainable, resilient and self-sufficient food system. These discussions also shed new light on the intersection between traditional ecological knowledge and scientific knowledge. We are happy to present this “Kyoto 2016 Agroecology Declaration,” which reflects the results of these discussions. 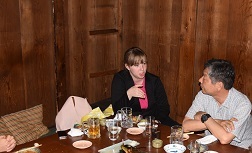 Japan today faces a host of socioeconomic challenges and environmental crises. A stagnant birth rate, rural depopulation due to the migration of young people to large cities, decreasing employment opportunities for the younger generation, and increasing income disparity between the rich and the poor stand out as major social problems. Climate change and the destruction of the natural and cultural landscapes as a result of urbanization and large-scale construction projects threaten people’s daily life. 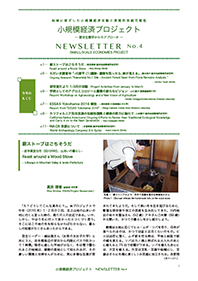 On top of these challenges, the 2011 Great East Japan Earthquake and the Fukushima Nuclear Power Plant accident forced people to think seriously about the issues related to food safety and food self-sufficiency. These social and environmental problems are all interconnected. Action plans are needed to restore the resilient human-environmental interactions and foster long-term sustainability. A key to achieving these goals is to promote local food systems with low external input dependency through organic agriculture and other agroecological practices. 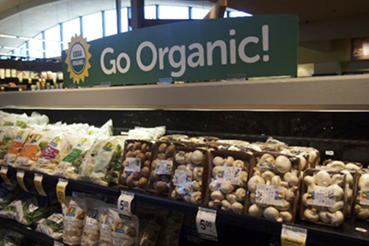 In Japan, attempts to promote organic agriculture became increasingly popular during and after the 1970s. Subsequently, these attempts received strong support from grassroots consumer movements. Along with a growing awareness of food safety, these historical contexts provide the foundation for a new food movement. Agroecology is a trans-disciplinary approach rooted in both traditional and scientific knowledge that seeks to design and manage productive, biologically diverse, and resilient small-scale agricultural systems. These systems should be economically viable, socially just, culturally diverse and environmentally sound. Three key principles of agroecology are diversity, networking and sovereignty１）. Revitalize rural-urban linkages through locally-based and environmentally sustainable market systems that are independent from the control of large corporations. Galvanize environmental, farmer, consumer and other social movements to develop a strategy to achieve agroecological goals. Ask scientific community, both social and natural scientists, to support the agroecological movement with relevant participatory and trans-disciplinary research and educational programs that benefit both rural and urban societies at large, particularly women and young people. Encourage local and national policy makers to support a new food system that democratizes the production, distribution and consumption of healthy food. 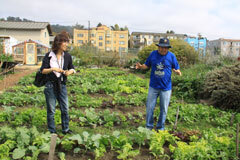 Link this agroecological movement internationally with similar movements in other countries and regions. １) The concept of sovereignty here refers to the autonomy of food production, energy self-sufficiency and technological independence at the local and regional level. Abstract: Soils globally are contaminated with arsenic, a carcinogen, with sources including agriculture and mining. When dangerous levels of soil contaminants are discovered, conventional remediation methods call for excavating and replacing soil. However, this is very expensive and wasteful. Researchers have discovered a technique to remediate arsenic contamination, called phytoremediation, which uses green plants to remove arsenic while leaving the soil in place. The brake fern (Pteris vittata L.) can take up arsenic from the soil through its roots and transport it to its fronds, where it is accumulated at very high concentrations. Harvesting the fronds removes arsenic from the soil over time. While this new method for decontaminating soil is promising, there is considerable work to do before this fern can be used in real-life situations. For example, the fern currently removes arsenic from soil very slowly. Our goal is to investigate ways to make phytoremediation with the brake fern more effective and efficient. We investigated how intrinsic properties of soil, such as texture, and soil treatments, such as fertilization, affect the uptake of arsenic in the ferns. We combined results of field, greenhouse, and laboratory bench-top studies to understand processes at multiple scales. Our results show that soil texture and arsenic concentration affect arsenic uptake in the fern, with very high concentrations achieved in ferns growing in some but not all conditions present in our site. However, our best estimates of remediation times are on the order of decades. We are currently considering the role of arsenic availability in phytoremediation, to determine whether soils can be available for reuse once plant available arsenic is removed by the fern. This talk will introduce arsenic as a soil contaminant, consider emerging sustainable methods for remediating arsenic contamination, discuss our current results, and share our future work. "Kawaratai No.1 Site - Ancient Forest Seen from Floral Remains Analysis. " 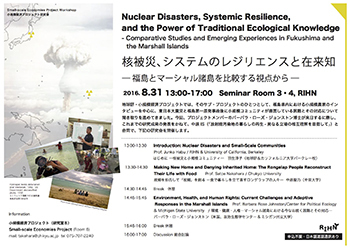 (4) Report from "ESSAS Yokohama 2016"
WS on Co-evolutionary Perspectives on the Anthropocene was held. 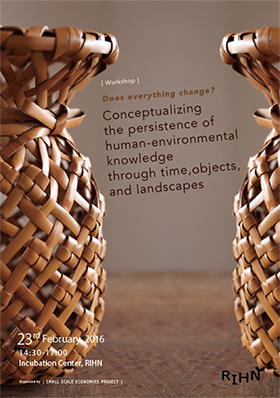 Workshop on Co-evolutionary Perspectives on the Anthropocene “Does everything change? 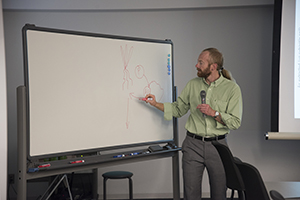 Conceptualizing the persistence of human-environmental knowledge through time, objects, and landscapes” was coordinated by Dr. Daniel Niles, a member of Small-Scale Economies Project and Associate Professor at RIHN, and held on 23rd Feb, 2016. 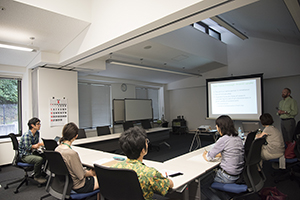 The participants included Prof. Sander Van Der Leeuw from Arizona State University, Dr. Benoit Hazard from Centre national de la recherche scientifique and Dr. Masahiro Terada from RIHN. How we are to approach Anthropocene and sustainability while maintaining “Whole Relationality” was the key question for the discussion, and the varied but insightful and transdisciplinary perspectives were presented and discussed by the participants. 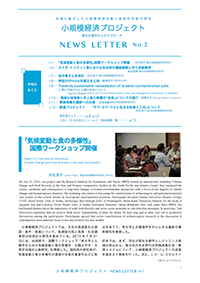 Dr. Kazunobu Ikeya (National Museum of Ethnology）and Dr.Tomiko Yamaguchi (International Christian University) posted report on the Field Report. 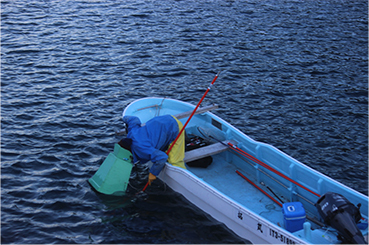 Dr. Yamaoto, Prof. Kanno and Ms.Shinkai posted a report about the field research on Triquet Island. We had held International Workshop.7 speakers presented for their research and discussed about next process. 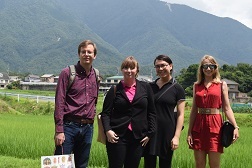 Students from University of California visited Japan to research with our project. 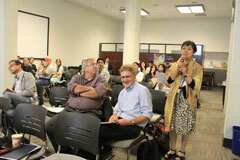 It was supported by Center for Japanese Study University of California and Japan Foundation. They also went to Shiga, Aomori, Iwate, Fukushima and Tokyo. They had interviwed person who working on the solution of environmental problem. We opened publication list of our project. 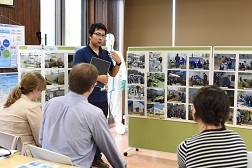 Together with JSPS and the Center for Japanese Studies of UC Berkeley, our project held a successful international symposium on “Long-term Sustainability through Place-based, Small-scale Economies,” on September 26-28, 2014 at the University of California, Berkeley campus. 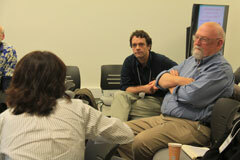 A broad range of scholars, including archaeologists, ethnographers, biologists, economists and ecologists, participated. The underlying theme of the papers and discussions dealt with issues of scale, resilience, and local knowledge. With growing populations, environmental change and the occurrence of human and natural catastrophes; understanding alternative food production systems is of paramount importance. Using case studies from prehistory to contemporary communities, a long-range continuum can be developed that explores small-scale adaptive strategies over extensive periods of time. The symposium nicely demonstrated how small-scale systems with greater food diversity capabilities help maximize food security, while minimizing risk. While the regional emphasis was on Japan and western North America, papers also covered several additional areas of the world, including Africa, South America, East and Southeast Asia. Professor Junko Habu has published a paper exploring human impacts on the environment. Habu, J. and M. Hall, 2013 Climate change, human impacts on the landscape, and subsistence specialization. In V. D. Thompson and J. Wagner (eds. ), The Historical Archaeology of Small Scale Economies, pp. 65-78. University Press of Florida, Gainesville, FL.